Purpose: Use this document as a reference for recording and tracking employee disability and accommodation information. Warning: This page is only accessible to those with the CTC_Disability_ADMIN Security Role. Please contact your local Security Administrator for additional information, if needed. Check the Disabled box, to indicate that the person is disabled. NOTE: If there is NO ACCOMMODATION associated with the Disability at this time, click SAVE and your entry is complete. If there IS an Accommodation associated with the Disability, click SAVE and continue to step 5. 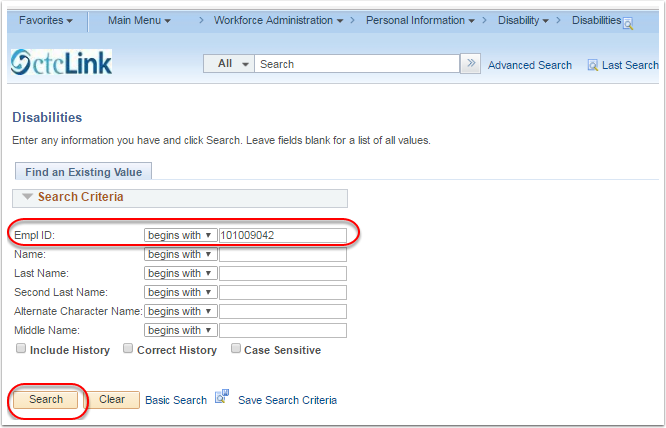 Enter the effective date of the request in the Date of Request field. Enter necessary comments in the Comment box. The Supervisor ID will default in the Responsible ID field, change if needed. In the Request Status section, the As of Date and Status will default, change if needed. 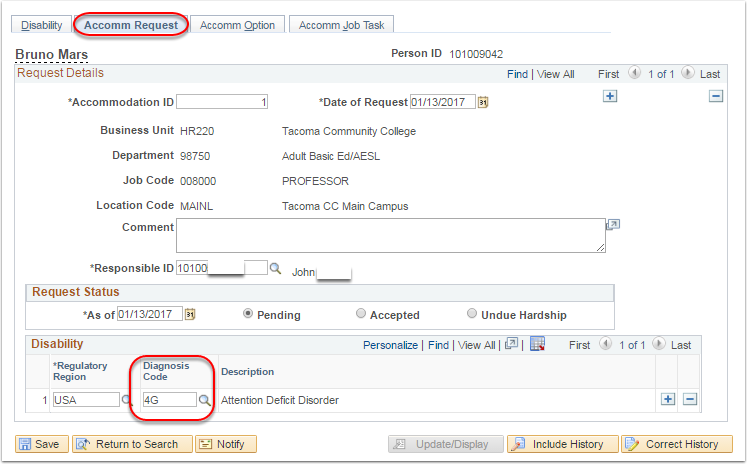 In the Disability section, select a Diagnosis Code from the lookup menu. Select the Type from the lookup menu. 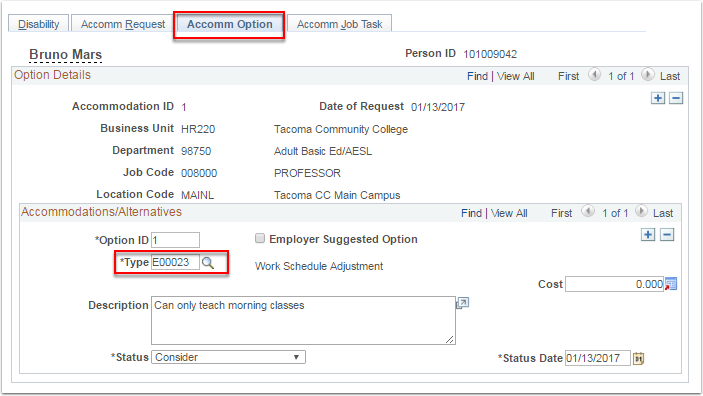 Check the Employer Suggested Option box, if applicable. Enter any costs associated with the accommodation in the Cost field. Enter a description in the Description field, to detail the accommodation. The Status will default to Consider, change if needed. The Status Date will default to today's date, change if needed. Click Save (Skip the Accomm Job Task tab, because there are no Job Tasks associated with positions at this time).